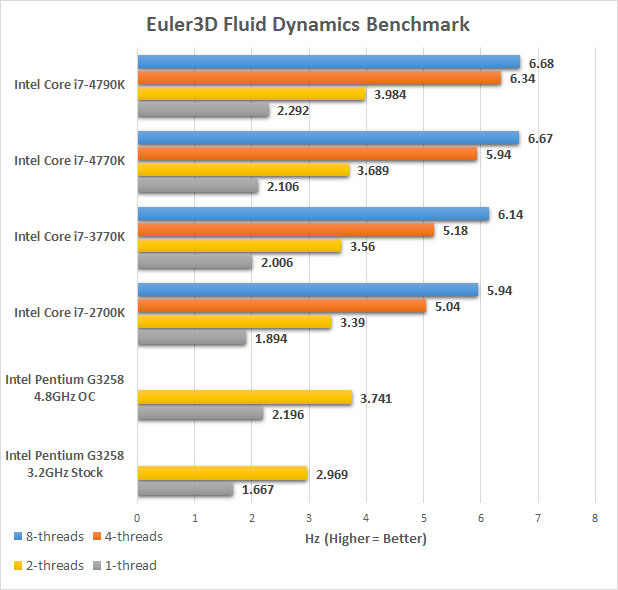 Next up is the STARS Euler3d CFD benchmark. The benchmark is intended to provide information about the relative speed of different processor, operating system, and compiler combinations for a multi-threaded, floating point, computationally intensive CFD code. The benchmark testcase is the AGARD 445.6 aeroelastic test wing. The wing uses a NACA 65A004 airfoil section and has a panel aspect ratio of 1.65, a taper ratio of 0.66, and a 45 degree quarter-chord sweep angle. This AGARD wing was tested at the NASA Langley Research Center in the 16-foot Transonic Dynamics Tunnel and is a standard aeroelastic test case used for validation of unsteady, compressible CFD codes. The benchmark CFD grid contains 1.23 million tetrahedral elements and 223 thousand nodes. 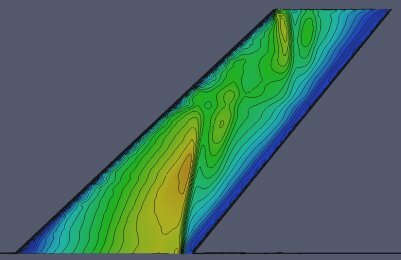 The benchmark executable advances the Mach 0.50 AGARD flow solution. The Intel Fortran compiler (ifort 10.0) is used and all floating point variables are Fortran’s double precision (8 bytes). Parallelization is through OpenMP. The benchmark score is reported as a CFD cycle frequency in Hertz and that is what we used to make out chart. Benchmark Results: The Intel Pentium G3258 in stock form isn’t anything to write home about, but when overclocked the performance is just a hair slower than the Intel Core i7-4790K Devil’s Canyon processor when it comes to single and dual-threaded performance.